Big companies have all of the resources they want, but they still miss the ball with SEO and content marketing. 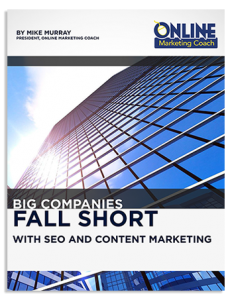 Get the details with my new study, "Big Businesses Fall Short with SEO and Content Marketing." Yes, they enjoy choice rankings. The problem is that they're missing out on thousands and sometimes millions of visitors because they don't rank high enough for some keyword phrases. I focused on the Fortune 100 and found that they fall to the second page of Google 19.4% of the time on average for the top 500 most searched keywords and phrases for each of their websites. They also rank near the bottom of the first page of Google for many search terms. 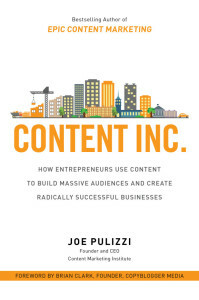 If you’re starting a business or just want to make yours better, check out Content Inc., the latest book by content marketing pioneer Joe Pulizzi. Joe, founder and CEO of Content Marketing Institute (CMI), packs in a ton of advice, examples, detailed case studies and numerous resources over 300 pages. I do help Joe and his team with some search engine optimization strategies. His book includes a section I contributed on keyword selection tips and tools (it originally appeared as a CMI blog post). I’d be recommending Content Inc. regardless of my role with CMI. It’s comprehensive, thought-provoking, and easy to follow. 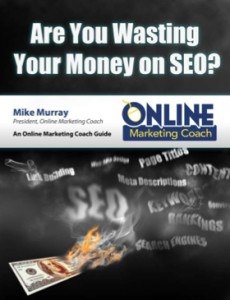 Free Guide: Are You Wasting Your Money on SEO? Are you about to blow some cash on SEO? It's time to rethink if you're going to make the right decision. It might make perfect sense or your choice could be a colossal mistake. Get my new guide, "Are You Wasting Your Money on SEO?" today and explore 10 aspects of SEO before you spend a dime on this outstanding marketing opportuity. 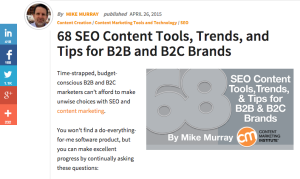 I packed in 68 SEO content tips and tools in a new article for Content Marketing Institute. Check out "68 SEO Content Tools, Trends and Tips for B2B and B2C Brands." You can save up to $405 by registering for Content Marketing World 2015 through Feb. 28th. The event isn't until September (September 8-11), but the Early Bird registration incentives are in full effect for Content Marketing World. The featured keynote speaker will be John Cleese, the famous, comedian, actor and a business motivator. You know him from several movies and Monty Python’s Flying Circus. In lecture settings, Cleese brings his award-winning series of videos to life. Over the decades, he has written, produced, directed and starred in great films. He received an Oscar nomination for best screenplay for A Fish Called Wanda. The largest content event in the world will feature a diverse lineup of 80 speakers - plenty of topics to explore.